Helping people to enhance the present and insure the future of the Kenosha Community. To accomplish this, we carry out our mission by building permanent endowments as charitable capital and maintain high professional standards in the investment and management of these funds. We also promote effective and efficient grant making to serve current and future needs of Kenosha County. 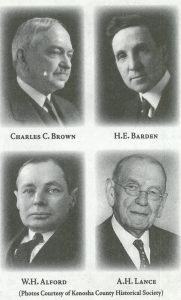 The Foundation, formed in 1926 as the Kenosha Foundation, was established by a group of community-minded citizens (including Charles C. Brown, H. E. Barden, W. H. Alford and A. H. Lance) to provide charitable-minded individuals and organizations the opportunity to create permanent endowment funds that were tax efficient and whose proceeds benefit the community. The income earned from the endowment funds would be used for grants to not-for-profit providers who were in a position to address a wide variety of social, cultural, educational, and other charitable needs throughout in the city. In the 1950’s, to reflect that our reach extended to all parts of Kenosha County, we became to Greater Kenosha Area Foundation. Then, in the 1990’s, to clarify our role as one of the family of over 300 community foundations in the US, we became the Kenosha Community Foundation. The Kenosha Community Foundation acts as a vehicle to serve donors with specific and unique charitable interests at all levels of giving. We strive to link donors with the charitable agencies that can most efficiently carry out the objectives and desires of the donors. We offer donors the maximum flexibility in terms of assets that can be used to create a fund and numerous options for the use of donors’ gifts. The Kenosha Community Foundation is a public charity governed by a volunteer Board of Directors. The Foundation recieves, invests, and manages charitable funds created by donor gifts and contributions. The Foundation uses investment professionals (including local banks and investment fund managers) to prudently manage and invest our assets. The performance of the investment professonals is monitored by the Executive Director and Finance Committee of the Board of Directors. Investment decisions are made by the full Board of Directors. The Foundation uses the income earned by funds to support programs and non-profit organizations that serve the Kenosha community. Our staff is experienced and knowledgeable in all aspects of charitable giving and can help individuals, families and business organizations make the right choices for their long term charitable interests. Benefit donors by creating and investing endowment funds in a way that both maximizes income and fund growth and at the same time use earnings to benefit our community forever. Provide responsible stewardship of assets entrusted to its care. Offer great flexibility to meet donors’ interests and needs. Operate efficiently, with a reasonable and cost-effective fee structure. Allow donors to maintain direct involvement in charitable giving. Provide local knowledge of changing community needs in the social services, education, community development, the arts and culture. Operate a thoughtful and responsive grant-making program that makes annual grants to local nonprofits from unrestricted endowment, donor advised and field of interest funds. Manage a set of endowment funds that provide scholarships to qualified students. We believe in the power of small community investments - when thoughtfully made, these can create lasting impacts.